This is a great meatless option. After making this I usually have a lot of leftovers, which means we have 2 meatless nights (and a night off of cooking!) 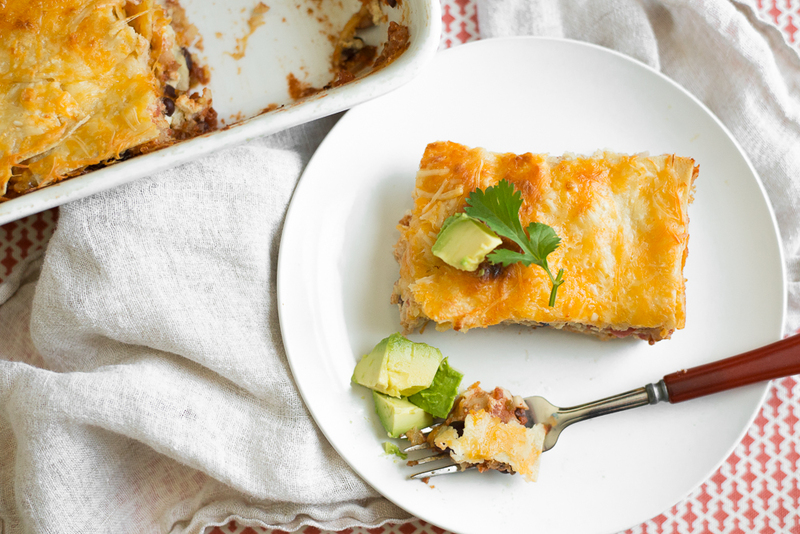 It’s basically a lasagna with beans, tortillas instead of noodles and Mexican flavors. And it's super inexpensive, too! You will notice that there is a lot of cheese in this recipe (probably one reason it’s so delicious!) This actually makes it a great recipe if there are family members who are underweight and need to increase calories. If you are maintaining or losing weight, you can reduce the cheese or I would suggest filling most of the plate with veggies and fruit, and serving a smaller portion of the lasagna. Tonight we served this with a side of steamed cauliflower and fresh mango slices. Yum!! Preheat oven to 350 degrees. Heat oil on medium heat in a large skillet. Sautee onions, garlic and pepper until soft. Empty mixture into a large bowl and mix in beans, tomatoes, salsa, chili powder, and cumin, mixing well. In smaller bowl combine ricotta, egg, and 1/4 cup parmesan cheese. Spray a 9×13 glass baking dish with cooking spray. Place about a cup of the tomato mixture in the bottom of the pan. Cut tortillas in half and make a layer of tortillas over the tomatoes (using the straight sides up against the sides of the pan). Top with half of the remaining tomato mixture. Spoon half of ricotta mixture over the top, spreading carefully. Sprinkle with 1/2 cup colby jack cheese. Put another layer of tortillas on top. Spread remainder of tomato mixture, then remainder of ricotta mixture, then 1/2 cup colby jack. Place one last layer of tortillas on top and sprinkle with remaining parmesan and colby jack cheese. Cover and bake for about 50 minutes until cheese is bubbly. Take foil off and bake an additional 5-10 minutes. Let stand 10-15 minutes before serving. The long cooking time means plenty of soft veggies for baby to explore. There are interesting spices for a new eater as well. If your baby needs a more fine texture, blend a slice of this in the blender with a little extra plain ricotta cheese.